Dryer Vent Cleaning Eldorado Hills CA 916 519 4569 Dryer Vent Cleaning Eldorado Hills, CA 916-519-4569: Dryer Vent Cleaning – How often should I have Dryer Vent Cleaning done? Dryer Vent Cleaning – How often should I have Dryer Vent Cleaning done? Dryer vent cleaning should be performed at least once a year to ensure your dryer is operating safely and efficiently. 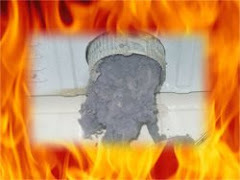 Failure to clean dryer vents is the number one cause of dryer related fires. Some people need to clean dryer vents more often, depending on several factors, including family size and age of the dryer. The older your dryer is the more likely you are to have a problem with lint build-up in the dryer vent system. Also keep in mind that older clothes dryers were not built to the same efficient standards as today's dryers so they may require more maintenance to keep them running efficiently. Do you just do a couple of loads of laundry on the weekend or do you have a very large enough family? The more active your clothes dryer is, the more often you will require dryer vent cleaning. How long is your dryer vent? The length of a dryer vent is a major factor to consider when scheduling regular maintenance. If you have a dryer vent that is more than 10 feet long (meaning from the back of your dryer to where the line terminates outside your home), this means a lot more space where lint can be trapped along the path and a higher need for more frequent cleanings. How many bends and turns? If your dryer vent system contains too many bends and turns your dryer will labor hard as it expels the heat and moisture. Dust and lint will build up more quickly in a dryer vent system with 45 or 90 degree turns. A dryer vent exhaust specialist will be able to correct this problem in most cases. Dryer vent cleaning is typically recommended annually by manufacturers and dryer exhaust specialists. If you have an unusual dryer duct system that is longer than average, and/or one with several bends and turns, or if you have a large family, your dryer vent professional might recommend dryer vent cleaning more often. Gina Fazil owns Dryer Vent Wizard, specializing in all dryer vent issues. Gina will do a complete inspection of your dryer vent system and explain your options. Dryer Vent Wizard provides dryer vent cleaning, dryer vent repair and dryer vent installation services for homes and businesses in in Sacramento, Solano County, Elk Grove, Folsom, Eldorado Hills, Roseville, Fairfield, Vacaville, Loomis, Lincoln, Davis, Rancho Cordova, Gold River, Rocklin, Granite Bay, Placerville, Vallejo and neighboring cities and communities.